MIDTOWN — Curious brains may once again soak up knowledge in style thanks to the reopening of two ornately decorated study halls at the main branch of the New York Public Library. 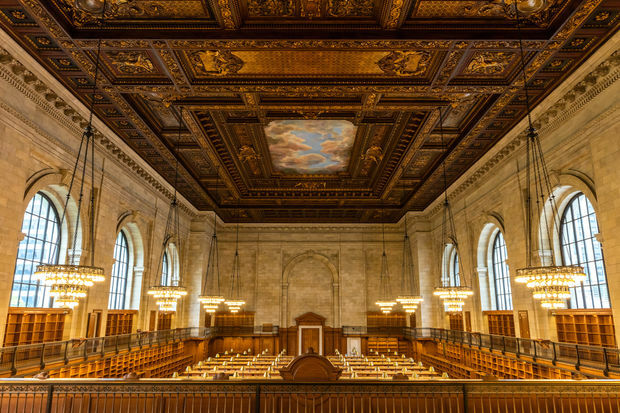 The Rose Main Reading Room and the Bill Blass Public Catalog Room, both located in the library’s Stephen A. Schwarzman Building at Fifth Avenue and 42nd Street, reopened on Wednesday morning after more than two years of renovations for ceiling restoration. Library fans flooded into the two reading rooms shortly after a ribbon-cutting ceremony Wednesday. “Yes, you can stay home and do your work on your computer, but watch: within a half an hour this room will be filling and it will be filled every day with those who say 'we want to be together, we want to be inspired, we want to use the great collections, we want to be in the library,'" NYPL President Tony Marx said. Marx was joined by library supporters and other dignitaries, including Sandy Rose, whose family is the namesake for the Rose Room. The $12 million renovations consisted of upgrades to ceilings and light fixtures, as well as the complete re-creation of a 100-year-old mural painted by James Wall Finn on the ceiling of the Blass Room. The Rose Room is also home to a mural by Finn, but thanks to a more recent refurbishing that mural did not need to be replaced, library officials said. The work began shortly after decorative rosettes on the ceiling of the Rose Romm came crashing to the floor over night on May 2014, raising concerns about the safety and integrity of the ceilings. The remaining 900 or so rosettes in both rooms were reinforced with steel cables, and workers restored the giant chandeliers hanging from the ceilings of the rooms, officials said. Both rooms opened along with the Schwarzman Building in 1911, and have since provided the city’s readers and scholars a quiet place to research and study beneath 52-foot ceilings. The Blass Room is outfitted with computers for patrons wishing to search back issues of the library’s catalog and request materials from the archives, according to a spokeswoman. During the renovations those computers were relocated to a second-floor corridor of the building, officials said. The New York Public Library's main branch also recently installed a new "book train" system to transport research materials from its stacks to the library.